Electrical engineers at Duke University have invented an inexpensive printed sensor that can monitor the tread of car tires in real time, warning drivers when the rubber meeting the road has grown dangerously thin. If adopted, the device will increase safety, improve vehicle performance and reduce fuel consumption. The group hopes that the tire wear sensor will be the first of many that could disrupt the $2 billion tire and wheel control sensor market. In collaboration with Fetch Automotive Design Group, the Duke researchers have demonstrated a design using metallic carbon nanotubes (tiny cylinders of carbon atoms just one-billionth of a meter in diameter) that can track millimeter-scale changes in tread depth with 99 percent accuracy. With two patents pending, the researchers are in the process of establishing industry collaborations to bring the technology to a tire near you. "With all of the technology and sensors that are in today's cars, it's kind of crazy to think that there's almost no data being gathered from the only part of the vehicle that is actually touching the road," said Aaron Franklin, associate professor of electrical and computer engineering at Duke. "Our tire tread sensor is the perfect marriage between high-end technology and a simple solution." In a paper published June 9 in IEEE Sensors Journal, Franklin and his colleagues flesh out their sensor design. The technology relies on the well-understood mechanics of how electric fields interact with metallic conductors. The core of the sensor is formed by placing two small, electrically conductive electrodes very close to each other. By applying an oscillating electrical voltage to one and grounding the other, an electric field forms between the electrodes. While most of this electric field passes directly between the two electrodes, some of the field arcs between them. When a material is placed on top of the electrodes, it interferes with this so-called "fringing field." By measuring this interference through the electrical response of the grounded electrode, it is possible to determine the thickness of the material covering the sensor. While there is a limit to how thick a material this setup can detect, it is more than enough to encompass the several millimeters of tread found in today's tires. 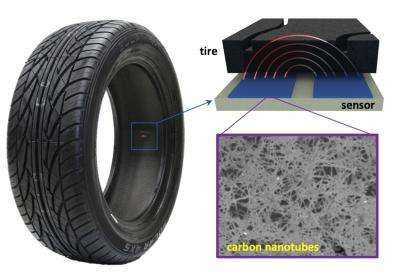 And with evidence of sub-millimeter resolution, the technology could easily tell drivers when it's time to buy a new set of tires or give information about uneven and often dangerous tire wear by connecting many sensors in a grid to cover the width of the tire. Tests also proved that the metal mesh embedded within tires does not disrupt the operation of the new sensors. "When we pitch this idea to industry experts, they say to each other, 'Why haven't we tried that before?'" said Franklin. "It seems so obvious once you see it, but that's the way it is with most good inventions." While the sensor could be made from a variety of materials and methods, the paper explains how the researchers optimized performance by exploring different variables from sensor size and structure to substrate and ink materials. The best results were obtained by printing electrodes made of metallic carbon nanotubes on a flexible polyimide film. Besides providing the best results, the metallic carbon nanotubes are durable enough to survive the harsh environment inside a tire. The sensors can be printed on most anything using an aerosol jet printer—even on the inside of the tires themselves. 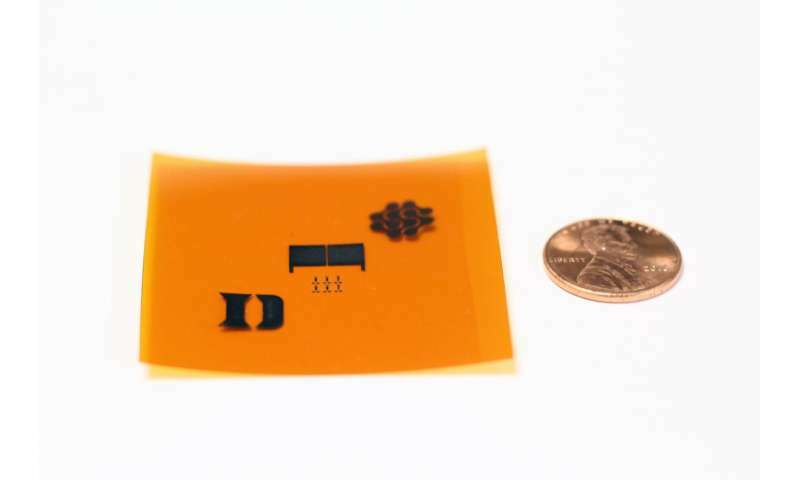 And, while it is not yet certain that direct printing will be the best manufacturing approach, whatever approach is ultimately used, Franklin said the sensors should cost far less than a penny apiece once they're being made in quantity. Franklin's group also wants to explore other automotive applications for the printed sensors, such as keeping tabs on the thickness of brake pads or the air pressure within tires. This is consistent with a key trend in the automotive sector toward using embedded nanosensors. Other tire tracking products have recently hit the market. For example, the tire company Pirelli recently unveiled a system to electronically track each tire—when it was installed, how many miles it has gone, when it was last serviced, etc.—and use an algorithm to estimate its wear and tear. While not the same thing as actively, physically measuring tire tread, it shows that the market is there for this type of information. But the technology isn't limited to cars. "This setup could be used with just about anything that isn't metallic or too thick," said Franklin. "Right now we're focusing on tires, but really anything you'd rather not have to cut apart to determine its thickness could be monitored by this technology in real time."